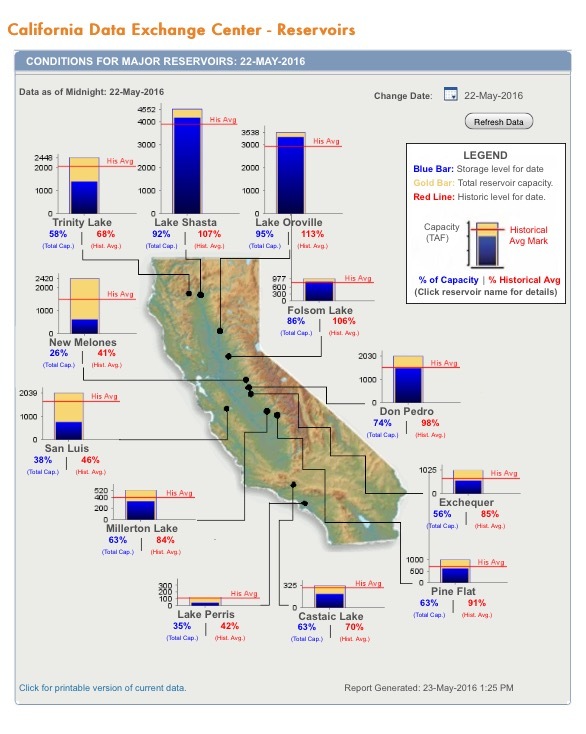 Ca Department of Water Resources Reservoir Levels as of May 22nd. Northern California has received some much needed rain this winter and snow in the mountains, helping to fill key reservoirs such as Oroville, Shasta and Folsom. 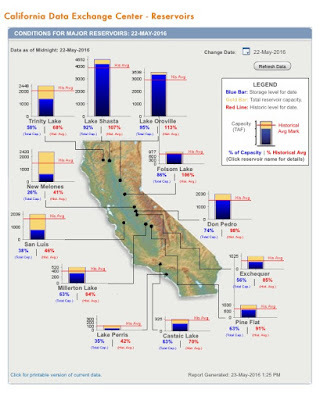 As you move south through the state, the reservoirs are far from full, many at below average capacity still. However, California is some what used to this situation. Much of the rain and snow falls in the northern part of the state and the southern desert regions receive much less rain and snow. That is why the California aqueduct, the State Water Project and the Federal Water Projects were built in the first place. To bring the much needed water from the north to the south. As the populations in the south grew and as farming in our state also grew, this battle started over who is more entitled to the water. I am not here today to try and solve that battle or even discuss it, it is a greater battle than we can accomplish. On May 9th, our Governor issued another Executive Order, as I feel people stopped conserving, stopped listening and starting wasting once again. Again, Governor Brown is mandating that Californian's adopt a new way of life. He is banning wasteful practices of hosing off sidewalks and driveways, using a hose without a shut off nozzle, the use of fountains that don't recirculate water. We have been in this drought for years now, why are people still doing these things to begin with? We all must conserve. Our state is too big, everyone must do their part. Thousands of acres of agriculture land have been fallowed due to the drought. Some agriculture water districts are asking for farmers to fallow up to 50% of their irrigated land. The picture at the beginning of the post is from my farmer friend Joe Del Bosque and just one of his many fallowed fields on the westside of Fresno County. 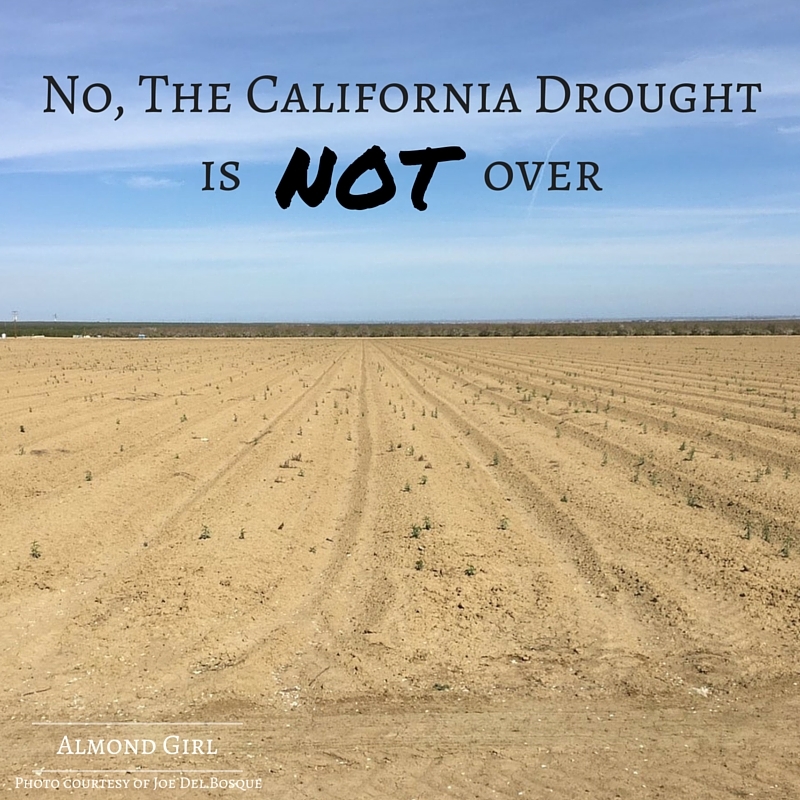 No, the California drought is NOT over. Farmers have gone out of business. Farm labor have lost their jobs. These people can no longer spend as they once have and subsequently, other businesses have closed in these valley communities that depend on agriculture and the agriculture employees as customers. It is a true ripple effect. Farms go out of business, farm labor loose their jobs, they can't buy good, general stores have to close their doors, people are effected in all walks of life. 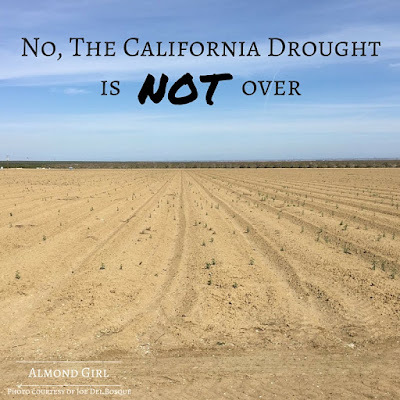 Our central valley has towns that have run out of water and have been issued bottled water for over a year to guarantee their community has a safe drinking water supply. But next time you drink bottle water, check the water source listed on the bottle. Most bottled water is filled right here in California, using more of our valuable resources. Water is a never ending issue in California. There will always be people fighting over it. There will be people going out of business over it. There will be crops thirsty for it. Until we prioritize water to the top issue in our state and build more infrastructure to manage our flow better, we will continue to have a problem. And we will continue to be in a drought.